As guide dog puppy raisers we teach our puppies 9 basic obedience commands before they start their formal training. 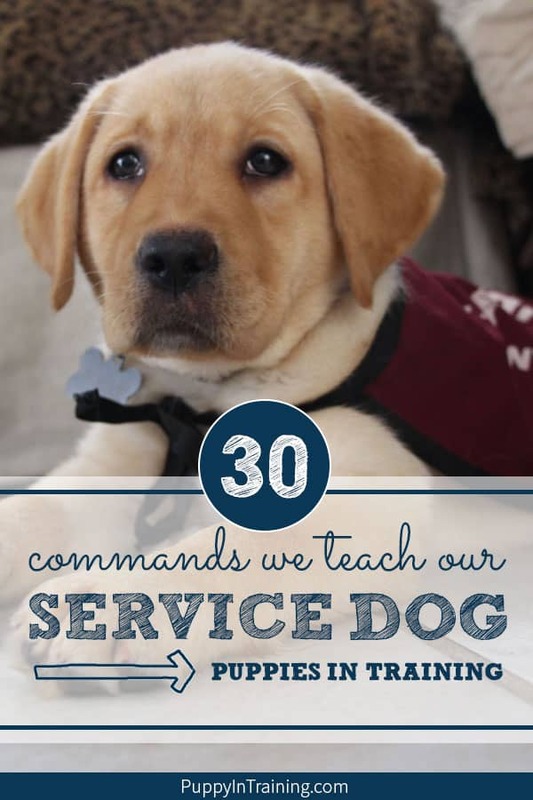 Adelle’s service dog training manual lists 30 commands! That’s right THREE – ZERO!!! We’ve been raising and training guide dog puppies since 2006 and we have the privilege of working with these puppies from the time they are 8 weeks old until they are 18 months. During this time we do our best to make sure they are rock solid with a handful of commands. When our pups move on to guide dog college they learn many more commands as well as advanced skills and intelligent disobedience. QUICK RECOMMENDATION: Unfortunately, if you’re not a puppy raiser then you likely do not have access to a service dog training manual. However, there are many good puppy training books available. One of our favorite books is Puppies for Dummies. We read Puppies for Dummies several times before we adopted our first puppy, Linus. What Do We Teach Our Service Dog Puppies In Training? Teach our pups good house manners. The basics are the same whether you are a guide dog puppy raiser or a service dog puppy raiser. As mentioned earlier the big difference is we have to teach our service dog puppies 30 commands vs only 9 for our guide pups. That’s right! Canine Support Teams has a list of 30 commands we are tasked to teach our service dog puppies in training. In fact, learning how to teach these different commands is one of the main reasons why I was interested in raising a service dog puppy vs. a guide dog puppy. Adelle taking a nap during training?!? Lucky for us we are puppy raiser manual gives us a list of commands that we are to teach our puppies including what our pup’s physical response should be, application, and notes. So, now you’re wondering exactly what commands do you teach a service dog puppy in training? UPDATE: 5 years ago we followed CST’s standards to teach 30 commands, but guess what? We expanded or list to teach our current puppies even more skills (check out the bonus section). We also included a little more detail about each command. Our future puppies in training will learn all of these skills. At the moment we are working with Raven, Mother of Puppies (Yep, I watch Game of Thrones) on all 45 commands. QUICK TIP: For several years we’ve been clicker training our puppies. Stay tuned for a more a blog post on how to clicker train your puppy. 0. NAME – to get your puppy’s attention. Surprisingly this wasn’t on the CST list, but possibly one of the most important commands you can teach your puppy. Tips to teach your puppy her name. 1. WATCH ME – your puppy makes eye contact. Important for getting your puppy’s focus away from distractions and on you. 2. SIT – your puppy sits on her rump. She will sit anytime, anywhere on command. Default position. Get your puppy to SIT/STAY when you are in public and not interacting or not in motion. 3. DOWN – your puppy put’s her entire body lying down on the floor. She will down anytime, anywhere on command. 4. STAND – to stand on all 4 legs. Standing is a good time to allow your puppy to be groomed or inspected. Do not confuse with HERE. 6. HERE (CST used the command COME HERE) – to advance to you in no specific position. Puppy is required to come close enough to you, but doesn’t have to sit. COME is being used as a formal recall to get into the HEEL position by your side. HERE is more informal and just calling your puppy to come back to you, but not in a specific position. 7. STAY – To freeze in her current position. When the STAY command is given freeze in that position whether it is after SIT, DOWN, STAND, etc. 8. WAIT – To stop moving forward. Not required to stay in current position can move between SIT, DOWN, STAND as long as she doesn’t cross a threshold. The only requirement is that your puppy remains behind the designated boundary. When your puppy is in the car they should be on an automatic WAIT. 9. RELEASE – To be done with work. UPDATE: We used to use “OK”, but because “OK” is such a common word we are using RELEASE instead. Used to let your puppy know she is done working. 10. NO – To get the puppy’s attention and tell her she is not doing the correct thing. Given when puppy does not follow through on the command. With Adelle it was something like this: Give the command “DOWN”… wait a few seconds, no response “NO”… pause repeat command: “DOWN”. 11. DON’T – To refrain from commencing with a bad behavior that is not wanted. Given in anticipation of the puppy doing an inappropriate behavior. 12. OFF – To remove herself from whatever item or object she is on and place all her feet back on the floor. Keep four on the floor. Use when your puppy is jumping up on you. Also often used when your puppy is on something inappropriate. Super mega important! Use OFF not DOWN. 13. LET’S GO – To start to move. The cue to let your puppy know it’s time to start moving forward. 14. HEEL – To be in position on your left side. The puppy is to move from any position into a HEEL on command. The heel of your puppy’s foot should be aligned with your heel. 15. SIDE – To be in position on your right side. 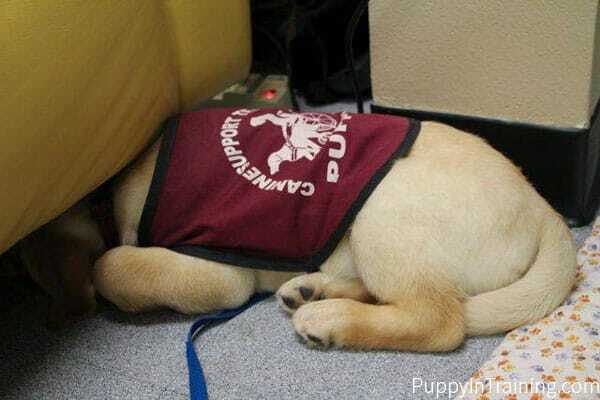 The puppy is to move from any position into a SIDE on command. 16. LEAVE IT – To move her head away from whatever she is touching or about to touch and making eye contact with you. Given before she makes contact with whatever she’s trying to approach, sniff, eat, etc. 17. GET BUSY (CST used the command BETTER GO NOW) – To let your puppy know it’s time to potty. Start using from day 1 when potty training your puppy. BETTER GO NOW was CST’s command for going potty, but we prefer the GDA command GET BUSY. We used GET BUSY (or BETTER GO NOW for Adelle) with all of our puppies even dating back to Linus. 18. SETTLE – To calm down. It’s time to be serious! Used when the puppy is overly-excited or running around inappropriately. When your puppy is calm praise calmly as to not get her excited again. 19. GO THROUGH – To move ahead of the person turn around and position herself to be able to back up through a narrow doorway or passage. When you move through a doorway along side your puppy, then it is not a “GO THROUGH”. It should be a HEEL or SIDE. 20. BACK – To step backwards. 21. FOLLOW – To move behind you as she moves forward through a door or passage. Used when your puppy is tethered to a wheelchair or scooter. 22. GO AROUND – To move around the person or object. On-lead is used when your puppy goes around the opposite side of a pole, tree, wheelchair, etc. and need to come back around to the correct position. 23. MOVE – To physically move her body in any direction. Have your puppy move out of the way of you or someone else. We’ve been working on this one with Raven. For some reason we always want her to move. 24. CLOSER – To move closer to within inches of you. Good for GET DRESSED, retrieving items, grooming etc. Raven is the master of closer. Such a Golden Retriever. 25. GO TO – To go over to another person. Followed by a person’s name. GO TO MOMMY! Emma knows that one. She’s my 1 year old daughter not a puppy. 26. UNDER (CST used the command GO IN) – To crawl into a space and bring in paws in tail out of the way. Used to get your puppy under and out of the way. Examples: under a chair, table, etc. 27. THAT’S ALL – To stop the behavior. Tells the puppy that it is time to stop behaviors that are permitted. Examples: to stop scratching, chewing or licking herself. 28. CAREFUL – Approach carefully. She’s taking something from your hand or touching you. Use a soft, calm, yet firm voice. This was important for Stetson who snaps when taking treats from your hand. 29. GET A DRINK – To get a drink of water. This is a CST command that we are not using with our current puppies. 30. QUIET – Stop barking, whining, howling. When your puppy is barking innappopriately. Those were the 30 (31 if you include NAME) commands required by CST, but here are 14 BONUS commands we plan to teach all of our future service dog puppies in training. For all of you overachievers who liked doing the extra credit even after acing the test. BED – go to the bed and lie down. CAR – jump into the car. DRESS – step into your harness/jacket. DROP – release the toy (or other object) from your mouth. HURRY – pick up the pace puppy. KENNEL – go into your crate. LAP – two paws on lap. ROLL – roll onto her side. Good for giving belly rubs! ROLL OVER – roll from one side to the other. SHAKE – puts paw to your extended hand. TOUCH – put your nose on the two fingers. UP – get her full body up on something. Example: up onto a platform, stage, couch (if you allow that), etc. QUICK TIP: We use treats and positive reinforcement when working with our puppies. Zuke’s Mini Naturals and Happy Howie’s Rolls are some of our favorite training treats. We also highly recommend the PetSafe Treat Pouch. That’s it! That’s a whole heckuvalotta (it’s a real word) stuff! What am I Canadian? Well, I do love watching and playing ice hockey. Adelle is 5 months old and we’ve touched on many of these commands already. We are very good at some, okay at others, and some we’re not too sure how to teach yet. The good news is we will be attending special classes with Canine Support Team trainers where we’ll learn exactly the things we need to work on. Of course that’s not all the commands we will teach our puppies. When Adelle leaves my home she will move forward to the Prison Pup Program where she’ll learn advanced skills and commands. I’ll talk to you more about the different commands we are working on in the coming weeks. Are you teaching your puppies anything interesting or fun? QUICK RECOMMENDATION: If you’re just starting to teach your puppy the basics then as mentioned earlier check out Puppies for Dummies. It’s a great introductory book on raising and training your puppy. 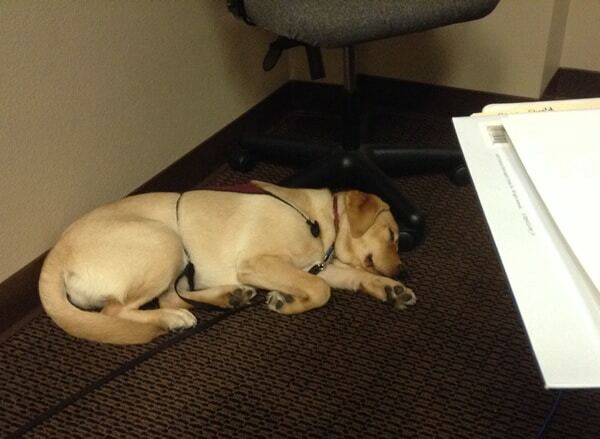 UPDATE: Adelle made it as a mobility service dog and is working in California with her new partner. UPDATE: This post was originally published October 15, 2013. We made some updates and left some of the content the same. We’ve learned a lot over the past 5 years and it reflects in the new information. I want to be able to teach my dog good house manners even if he’s going to be a service dog. To be honest, I think it would be a good idea to hire a trainer who will teach my dog what name he should respond to. Thanks for mentioning that the basics are the same for service dogs so I’m sure that whoever will get him will have an easy time once the trainer teaches him basic commands that he should follow. Yep, it’s great having a trainer to work with. Even though we’ve been doing this for over 15 years we still work with trainers to help us work with our puppies.